In honor and memoriam for our dear friend and colleague, Scotty Littleton–we reproduce his eyewitness account of one of the most significant UFO events in history on this 73th anniversary–FW. 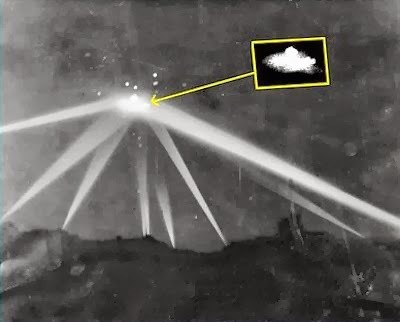 At first, it was widely suspected that a high-altitude, carrier-based Japanese observation plane had strayed over the L.A. area. Or perhaps one of our own military planes was the culprit—although no 1942-vintage airplane was capable of standing still in the air. The one thing we did learn after the war was that neither the Japanese nor our own military have an “official” record of any of their aircraft flying over the L.A. basin that fabled evening. Even the presence of our pursuit planes, which was absolutely certain, has been denied. Of course, all concerned could be lying—though the probability of such a lie persisting for over sixty years is remote. That is, assuming what we saw was a terrestrial craft. In recent decades several Ufologists have suggested that it might have been one of the largest mass UFO sightings in history, as it involved well over a million people. Only the sightings over Mexico City in the mid 1990s exceed it in terms of the total number of percipients. To be sure, no one suggested this theory at the time, as it wasn’t until five years later, in 1947, after civilian pilot Kenneth Arnold’s landmark sighting of nine “flying saucers” over Mt. Rainer in June of that year, that the notion that UFOs from other planets might be invading our skies became widespread—although if the theory that a crash retrieval occurred at Cape Giradeau, MO, in 1941 is correct, it’s quite possible that the government had at least a modicum of knowledge about the phenomenon by 1942. Several years ago, I joined forces with Ufologist Frank Warren, who’s been fascinated by this event for many years—although he’s of course much too young to have observed it personally. With the help of well-known Navy photo-analyst and UFO investigator, Dr. Bruce Maccabee, Frank and I have pretty well determined the craft’s path before it appeared in the sky over Hermosa Beach. 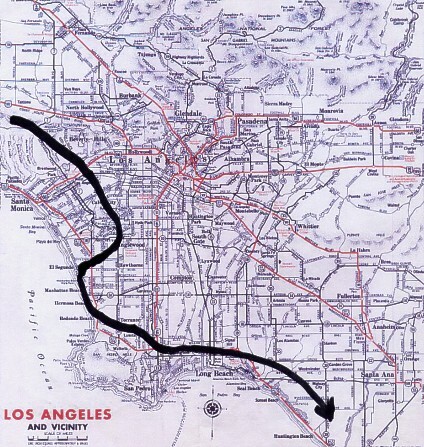 It was initially observed by several residents of the Pacific Palisades rising over the Santa Monica Mountains around 2:45 a.m. From there, it seems to have moved southeast across Santa Monica and West L.A. in the direction of the Baldwin Hills, which separate Culver City from Inglewood and the flatlands to the south. A Los Angeles Times reporter living in the San Gabriel Valley, a dozen miles or so to the east, had been alerted to what was happening by colleagues at the paper. He jumped in his car and began driving west as rapidly as he could toward the sound of the guns, arriving at the northern edge of the Baldwin Hills, in the vicinity of Jefferson and La Cienega, in time to photograph the object as it rose over the ridge line. . . .